NESREEN GHONAIM STEPS OFF THE CURB AND INTO TRAFFIC. CARS SLOW, ALLOWING US TO CROSS. IT’S A FEW MINUTES PAST 7PM AND THE RUNNING GROUP SHE LEADS IS WAITING. SHE HUSTLES DOWN THE WALKWAY, A WIDE MERIDIAN STRETCHING THE CENTER OF TAHLIA, ONE OF THE BUSIEST SHOPPING STREETS IN THE PORT CITY OF JEDDAH. HER BLACK ABAYA, THE LONG ROBE WOMEN MUST WEAR IN PUBLIC, SWISHES AROUND HER CALVES. Nesreen is 43, with warm eyes, high Egyptian cheekbones, and curls that bounce as she moves through the evening crowd. Twenty feet ahead, about 15 women wait in the walkway. They all wear abayas, running shoes, and various forms of head covering, from the veiled niqab to a loose hijab, or no head covering at all. The women—mothers, professionals, students—smile and embrace us when we arrive. This is JRC Women, a division of the local running group Jeddah Running Collective, which Nesreen heads. They’ve recently launched a couch-to-5K program to welcome newcomers, and while some in tonight’s group have been members for a couple years, many are new. “All right, gather round,” says Raghad Almarzouki, 31, who tag-team coaches JRC Women with Arwa Alamoudi, also 31. “We’ll run down the walkway, out to the grassy area and back,” she says, detailing the 5K route. She waves her hand, “Yalla.” Let’s go. The women take off down the path, a mosque across the street on one side, a female-only Gold’s Gym franchise on the other. Couples stroll as children dash about. A man kneels on a prayer rug. Veiled women walk with cell phones to their ears, and SUVs, luxury sedans, and the occasional rundown Toyota whiz by. The moment seems ordinary: a group of women out for a run in a city. Except that it’s revolutionary. The Saudi Arabian government, a monarchy that follows a conservative form of Shariah law, effectively banned women’s sports for decades. In the 1960s, when the country launched widespread public schooling, it prohibited physical education and sports for girls and barred women from forming sports teams or participating in sporting events. When JRC was founded in late 2013, the country had no women’s running groups. 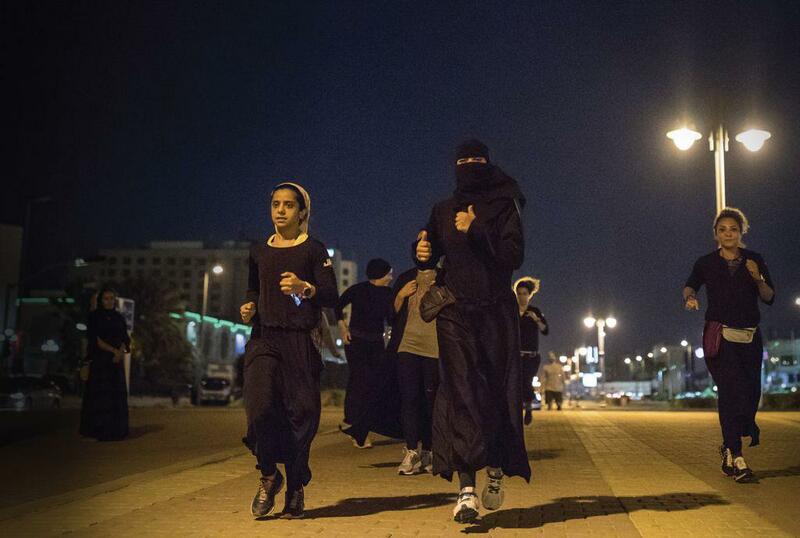 Now, from the western city of Jeddah, to the capital, Riyadh, to eastern Khobar, women are running in the streets, claiming a place and activity long considered inappropriate for their gender. In each city the running scene is a unique blend of the women themselves, the run groups, and the local political climate. The common thread: The women, and the men supporting them, are committed to advancing Saudi culture around women’s sports.